Today I’m going to show you how to use the Feel, Felt, Found method to express empathy to your customers. What’s great about the Feel, Felt, Found Method is it gives you the perfect response when you can’t give the customer exactly what they want. It helps you to be more relatable, and to foster a sense of connection with customers. The Feel, Felt, Found method is easy to use. First, you let the customer know you can relate to how they feel. Then, you explain to your customer that you’ve had other customers who have felt the same way. This helps your customer to realize two things: first, that you get how they are feeling and also, that they aren’t alone. Other customers have been where they are. And finally, you tell the customer what you, or other customers, have found to work in this situation. This is where you offer empathy and a possible solution, all in one. My daughter and I were in New York. We’d spent the day sight-seeing, and back at the hotel, my daughter’s iPhone showed all of her photos as blurry – not just the photos she’d taken that day, but every picture on her phone. To my 17-year old daughter, a problem with photos and her phone camera is catastrophic. It would have been easy for me to dismiss this as, “There are bigger things in life for you to worry about.” And that was my real temptation. But I could see she was distraught over this. Empathy is putting yourself in another person’s place. Sensing their situation, from their perspective. It’s also discussing the things that are upsetting to the person, maybe coming up with ideas to get them out of the situation they’re in. There are four attributes of empathy, and I teach each of these characteristics in my Empathy eLearning course. One of the characteristics is communicate your understanding. One of the skills we practice in my onsite customer service workshops is Empathy. Here are some of the exact phrases that I share in my training sessions for use in our role-plays – and in real life with customers. Two years ago I was working with a company to help their customer service representatives convey empathy to customers. The intended outcome of the training was for employees to speak to customers with care, concern, and compassion. Achieving empathy in the customer experience is a bit like walking a tightrope. Too much empathy can result in longer talk times and inappropriate sharing between customer service representatives and clients. Not enough understanding and reps can sound cold and uncaring. You have to find the right balance in empathy. Or else you fall off the rope, and the customer experience is negatively impacted. I asked my client how she saw appropriate empathy in her company. And here’s what she said. The biggest problem with the customer experience in most companies is how employees talk to customers. All too often, employees come across as indifferent, cold, uncaring, rushed or rude. This employee “attitude problem” can be the tipping point that sends customers to the competition. This attitude problem is what drives customers to tweet and blog about a poor customer experience. The great news is, with the right training and strategy, employees can learn how to soften tones, truly convey empathy, make customers feel taken care of and even make memorable personal emotional connections with customers. Here are 5 tips to get you started on the right track for how to talk to your customers. Even when customers are wrong, it’s best not to correct them. 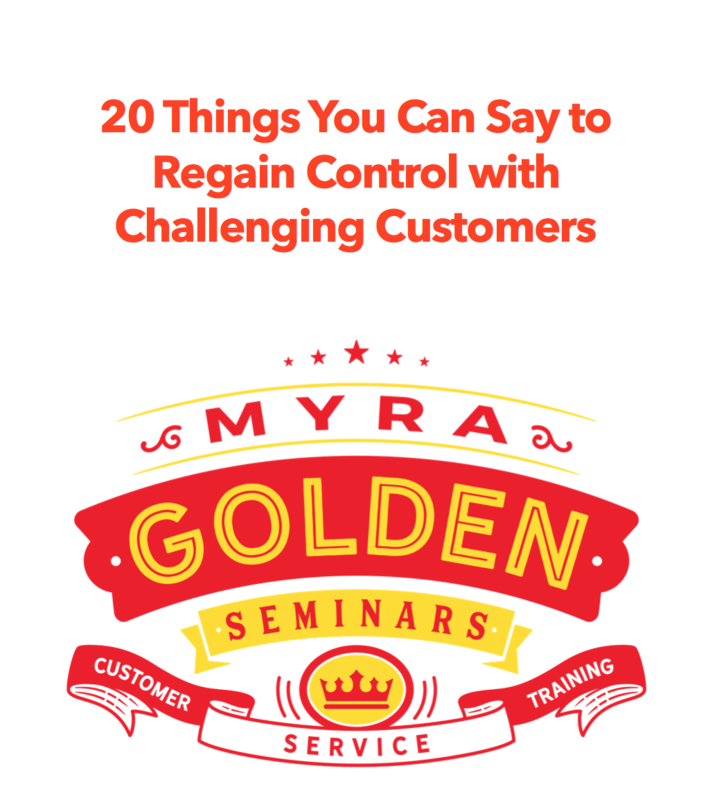 Telling customers they are wrong can put them on the defensive and make interactions tense. If the matter over which the customer is wrong is not critical, try to let the little wrong slide. Try to meet your customer where she is and pace her needs. If your customer is asking lots of questions, sounding confused or frustrated, or continues to ask for clarification, you have an opportunity to pace. You can pace this customer by taking the time to slowly cover every detail and by checking to ensure you are clear and understood. When speaking with a customer who sounds busy or savvy, you can pace this customer by getting right to the point and giving them what they need quickly and efficiently. Now you can give your employees even more great skills for delivering the best customer experience. Sign up for my newsletter if you don’t get it already – and learn specific tips, approaches and phrases to help your employees deliver a delightful and friendly customer experience.